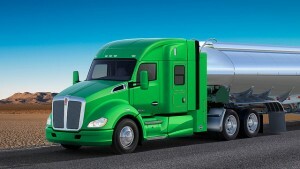 Big Rigs: Will the Climate Benefit from Switching Diesel Trucks to Natural Gas? « Want to See EDF at SXSW Eco 2015? Cast Your Vote! The surge in natural gas production that has reshaped the American energy landscape has many in the commercial transportation sector considering whether to start shifting their heavy-duty vehicle fleets from diesel to natural gas fuel. Many are looking to an advantage in carbon dioxide emissions to justify the higher cost and reduced fuel efficiency of a natural gas vehicle. But in fact, a study published today in Environmental Science & Technology finds that while there are pathways for natural gas trucks to achieve climate benefits, reductions in potent heat trapping methane emissions across the natural gas value chain are necessary, along with engine efficiency improvements. If these steps are not taken, switching truck fleets from diesel to natural gas could actually increase warming for decades. Methane, the main ingredient in natural gas, has 84 times more warming power than CO2 over a 20-year timeframe. Reducing emissions throughout the natural gas value chain is an important opportunity to reduce our overall greenhouse footprint. The new study examines several different types of engine technologies, and both liquefied and compressed natural gas fuels, and concludes that a conversion from diesel could lead to greater warming over the next 50 to 90 years before providing benefits to the climate. These results align with an earlier paper published by EDF scientists in 2012 in the Proceedings of the National Academy of Sciences (PNAS), but reach these conclusions through updated and more detailed data, as well as analysis tackling a wider scope of vehicle sizes, engine technologies, and fuel types. By examining a range of assumptions, the new study finds there are indeed pathways for heavy duty natural gas vehicles to achieve climate benefits, provided methane emissions across the value chain are reduced both upstream and at the vehicle level. Improvements in fuel efficiency could help ensure these vehicles are climate friendly. Today’s natural gas truck engines are typically five to fifteen percent less efficient than diesel engines. Consuming more fuel for each mile traveled reduces the relative CO2 savings. If that efficiency gap can be closed, natural gas trucks will fare that much better compared to diesel. While emissions in the natural gas value chain are a serious challenge, they also represent an opportunity to achieve significant, cost-effective reductions in overall greenhouse gas emissions. Several policy mechanisms are in play that could improve the climate prospects of natural gas trucks. These include recently announced federal upstream methane regulations and upcoming federal fuel efficiency and greenhouse gas standards for heavy trucks. More information is needed to estimate with confidence the current climate footprint of trucks, and to get a better understanding of methane loss along the natural gas value chain. Significant research is underway to update estimates of methane emissions across the U.S. natural gas system, including the ambitious scientific research effort to publish 16 field studies launched by EDF and its partners. The paper released today is distinct from this ongoing effort and does not use any data from those studies, but it serves complementary purposes: First, it emphasizes the importance of gathering more and better data on methane loss; second, one of its major contributions is the various “sensitivity analyses” it presents. These ranges of potential results are designed to understand the implications of changing underlying assumptions about methane emissions and efficiency. Our new paper creates a framework to evaluate the climate impacts of a fuel switch to natural gas in the trucking sector as we gain better data on the magnitude and distribution of leakage and as both leakage and vehicle efficiency evolve due to policy changes and market dynamics. Policymakers wishing to address climate change should use caution before promoting fuel switching to natural gas in the trucking sector until we are more certain about the magnitude of methane loss and have acted sufficiently to reduce emissions and improve natural gas engine efficiency. For more detail on the paper released today, please see our Frequently Asked Questions.